Do you like honey? Have you ever wondered how bees make it? Or how beekeepers track what their hives are doing? 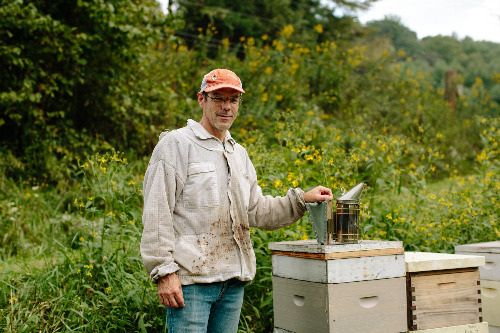 Well Dr. James Wilkes, owner of Faith Mountain Farms and co-founder of Hive Tracks is will answer those questions and let you taste some of his honey! Faith Mountain Farm is a family farm located in Creston, NC. James and Shannon Wilkes and their children (Margaret, Galen, Sullivan, Israel, Lillian, Zion, Oliver, Vivian) started the farm 12 years ago when the moved from nearby Boone, NC to the farm property. They grow a variety of produce and sunflowers, raise chickens and pigs, make delicious baked goods, and keep honey bees for raw honey! You can find their products at Watauga County farmer’s markets, the High Country Food Hub, and BRAHM’s gift shop! James and Shannon Wilkes and their children (Margaret, Galen, Sullivan, Israel, Lillian, Zion, Oliver, Vivian) started the farm 12 years ago when the moved from nearby Boone, NC to the farm property. They grow a variety of produce and sunflowers, raise chickens and pigs, make delicious baked goods, and keep honey bees for raw honey! You can find their products at Watauga County farmer’s markets, the High Country Food Hub, and BRAHM’s gift shop! In addition to producing delicious food, James developed a software called HiveTracks which assists beekeepers in monitoring and managing their hives. HiveTracks delivers best-in-class, cloud-based software and data analytics products focused on honey bee health, beekeeping optimization, and the honey bee’s direct connection to global food production. Through this focus, beekeepers are able to impact not only the sustainability of the honey bee, but the sustainability of our planet as a whole. James Wilkes, Ph.D. – James is a beekeeper, college professor, farmer, entrepreneur, and a Ph.D. in computer Science. He is a Professor in the Department of Computer Science at Appalachian State University in Boone, NC and works at the intersection of computing and honey bees on various projects including the Bee Informed Partnership. He also operates a diverse family farm that includes a thriving honey bee business. Lastly, James is co-founder HiveTracks. James has owned bees since the year 2000 when his father brought him two hives; however, he grew up with bees in his backyard. His father always had two or three hives behind the house even though they lived in town on less than half an acre. James kept 3-5 hives in his backyard for five years until moving to a farm in 2005. Since then he has had as few as 5 (a bad winter) and as many as 120. He invites you to explore this fascinating hobby that is never boring and produces delicious honey.